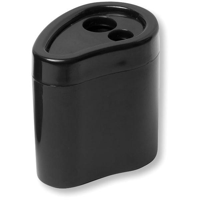 Pencil sharpeners might seem an unlikely promotional product but just think how many people use a pencil, in which case they need a pencil sharpener! It doesn't need to be just school children, teachers and many other professions still use pencils. The question to ask is what products your target audience use on a daily basis and then ask us to print on that product making it a useful everyday product where your message will get seen everyday.